Home/About Us, Sale, Tincture/Need a higher CBD dosage? Check out these Tinctures and Capsules. Did you know that we have high dosage Tinctures and Capsules? This is perfect for those that need more CBD! They both come in 1500mg and 3000mg bottles! So what are the benefits to our Tinctures and Capsules? Tinctures are one of our fan favorite products and come in a variety of dosages from 300mg bottles to 3000mg. There are both human and pet versions. The human version has an isolated spectrum and full spectrum versions as well! They are also one of our most versatile products, they can be taken under the tongue, used topically, added to your pets food or a treat and even put into almost any food you’re eating (just avoid putting it in super hot food!) They have a pleasant flavor, the cbd is mixed with hemp oil for added benefits! Our capsules are a long-standing product that hold up to the test of time. They’re easy to take, packed with CBD and come in 1500mg and 3000mg bottles. They’re wonderful for on the go or while traveling as they are discreet and easy to pack. If you prefer a pill version vs a tincture these high dosage capsules are perfect for you! From now until the 15th, BOTH of these products in the 1500mg and 3000mg dosages and both spectrums of tincture will be 15% off! These high dosage products will fly off the shelves so get them at the discounted price while supplies last! All Pure Hemp Botanicals products are lab tested to determine their cannabinoid profile and hemp extract potency. This ensures that every batch of product meets our strict standards for quality and consistency. Our quality control consistently exceeds current market standards, so you know what you read on our product labels is exactly what you’ll get. Trust that you’ll receive tested, credible products of consistent quality from Pure Hemp Botanicals. 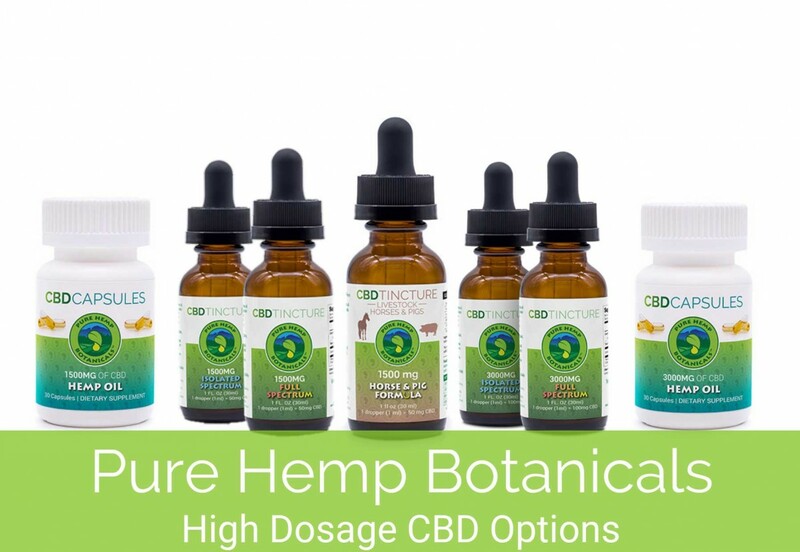 By conducting accurate, meticulous tests, we can substantiate the volume of CBD printed on our product labels, as well as provide clear ingredient lists and dosing information. In fact, we’re currently in the process of publishing the results of lab tests for all our products because we believe in the healing properties of hemp and strive to make it safe and accessible for everyone.